Kick off your visit on the 16th (Sat): steep yourself in history at Mandela House, then examine the collection at Apartheid Museum, and then ponder the world of politics at Constitution Hill. To see where to stay, other places to visit, and other tourist information, read our Johannesburg road trip planning site . Use the Route module to find suitable travel options from your home destination to Johannesburg. In February in Johannesburg, expect temperatures between 32°C during the day and 19°C at night. Finish your sightseeing early on the 16th (Sat) so you can travel to Hoedspruit. 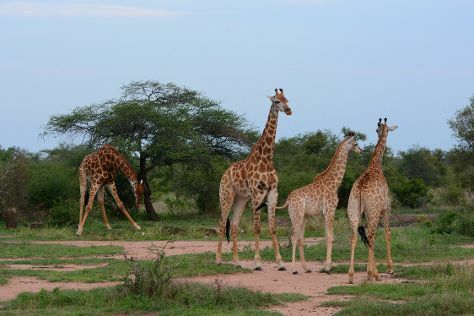 Kick off your visit on the 17th (Sun): explore the striking landscape of Kruger National Park. Here are some ideas for day two: Head underground at Sudwala Caves, stop by Joubert en Seuns Padstal, then admire the natural beauty at Lowveld National Botanical Garden, and finally stroll through Jane Goodall Chimpanzee Eden Sanctuary. To see ratings, photos, where to stay, and tourist information, you can read our Nelspruit holiday maker website . Getting from Johannesburg to Nelspruit by flight takes about 3 hours. Other options: drive; or take a bus. Traveling from Johannesburg in February, expect much warmer with lows of 32°C in Nelspruit. Cap off your sightseeing on the 18th (Mon) early enough to travel to Cape Town. Cape Town is known for nature, parks, beaches, shopping, and museums. Your plan includes some of its best attractions: stroll through Cape of Good Hope, explore and take pictures at Victoria & Alfred Waterfront, take in the awesome beauty at Signal Hill, and take in nature's colorful creations at Kirstenbosch National Botanical Garden. Make your Cape Town itinerary with Inspirock to find out what to see and where to go. You can fly from Nelspruit to Cape Town in 4.5 hours. Other options are to drive; or take a bus. Traveling from Nelspruit in February, you can expect nighttime temperatures to be much colder in Cape Town, with lows of 19°C. Finish your sightseeing early on the 22nd (Fri) so you can drive to Gansbaai. Nature lovers will enjoy a holiday in Gansbaai, a fishing village and tourism haven notable for its diverse marine life and numerous opportunities for outdoor activities. Kick off your visit on the 23rd (Sat): stroll through Panthera Africa - Big Cat Sanctuary, then stroll through African Penguin & Seabird Sanctuary, and then get outside with Outdoor Activities. For traveler tips, maps, ratings, and more tourist information, read Gansbaai planner . Getting from Cape Town to Gansbaai by car takes about 2.5 hours. Other options: do a combination of train and taxi; or do a combination of bus and taxi. In February, plan for daily highs up to 30°C, and evening lows to 19°C. Finish your sightseeing early on the 23rd (Sat) to allow enough time to drive to Oudtshoorn. Kick off your visit on the 24th (Sun): explore the fascinating underground world of The Cango Caves, tour the pleasant surroundings at Cango Wildlife Ranch, and then admire all the interesting features of Safari Ostrich Show Farm. To find photos, ratings, maps, and more tourist information, refer to the Oudtshoorn trip planner . Traveling by car from Gansbaai to Oudtshoorn takes 4.5 hours. Alternatively, you can do a combination of car, flight, and bus; or take a bus. In February, daily temperatures in Oudtshoorn can reach 28°C, while at night they dip to 17°C. Cap off your sightseeing on the 24th (Sun) early enough to go by car to Plettenberg Bay. Kick off your visit on the 25th (Mon): tour the pleasant surroundings at Knysna Elephant Park, stroll through Robberg Nature Reserve, and then steep yourself in history at Old Timber Shed. Keep things going the next day: stroll through Jukani Wildlife Sanctuary, then tour the pleasant surroundings at Birds of Eden, then stroll through Tenikwa Wildlife Awareness Centre, and finally tour the pleasant surroundings at Monkeyland Primate Sanctuary. For photos, other places to visit, where to stay, and more tourist information, refer to the Plettenberg Bay trip planner. Drive from Oudtshoorn to Plettenberg Bay in 2.5 hours. Alternatively, you can take a bus. In February, daily temperatures in Plettenberg Bay can reach 28°C, while at night they dip to 20°C. Wrap up your sightseeing on the 26th (Tue) to allow time to travel back home.